The pop-up beach shelter Zack II offers the ultimate in comfort thanks to the extremely quick set-up and take-down process, the size, the resting surface and the sophisticated ventilation concept. As a first-class alternative to umbrellas and sunbeds, beach shelters are attracting more and more followers. In this context, self-assembling beach shelters are particularly advantageous, as they save the user the time effort of setting them up and which makes it considerably easier to use a beach shelter. In this case, you just take the beach shelter out of the carrying case and „Zack“ it’s standing on the beach right in front of your eyes. In this category, we present the Zack II pop-up beach shelter, which has an extensive array of great functionalities and features. Where to buy? You can get your own Zack II via Amazon! For whom is the Zack II beach shelter useful? The Zack II beach shelter is suitable for all those who want to enjoy a comfortable beach vacation for two. With that in mind. the beach tent has enough storage space for all your beach stuff. What makes the Zack II beach shelter different from other pop-up beach shelters? 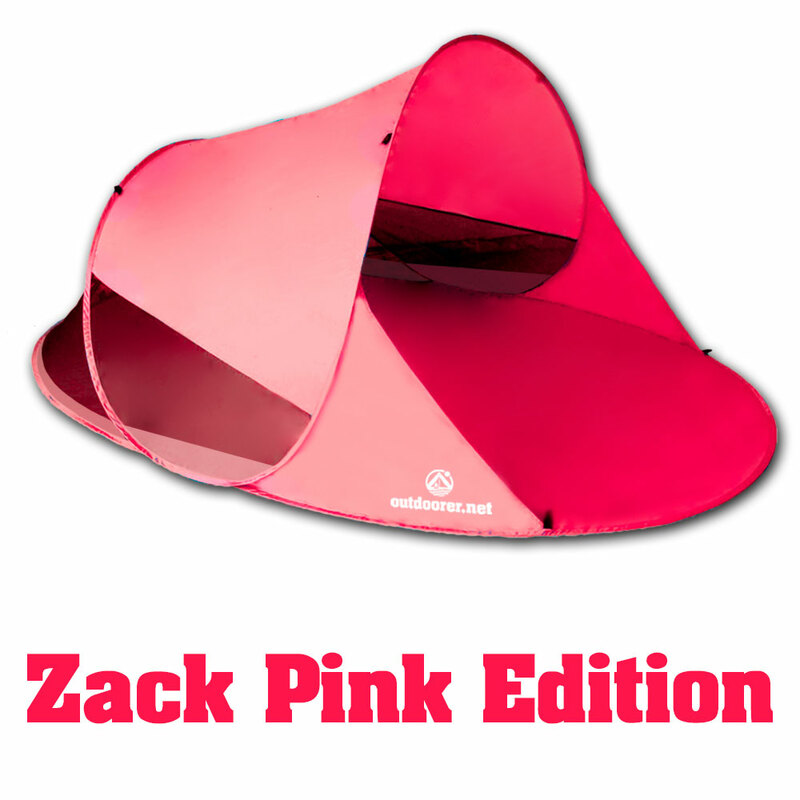 Not only does the Zack II beach tent pop-up in a second, but it is easy to take down thanks to the steel-wire poles. Waterproof take-down instructions are included! 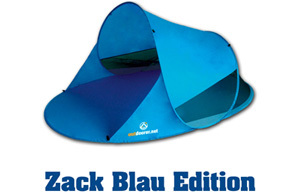 The Zack II has an all-around mosquito net on the front site, which provides optimal ventilation in the beach shelter. First-class solar and UV protection thanks to its special UV 60 coating. Excellent wind-protection, wind-resistance and overall safety thanks to its pegs. Only in stronger winds and very fine sand is it recommended to protect the beach shelter with additional sand pegs. Outdoorer provides the specially-developed V-shaped Sandfortress sand pegs for this purpose. The Zack II beach shelter offers plenty of room for two people who want to relax lying down and need sufficient storage space for all their beach items. The height of the beach shelter – 100 cm – also allows for a comfortable sitting posture. 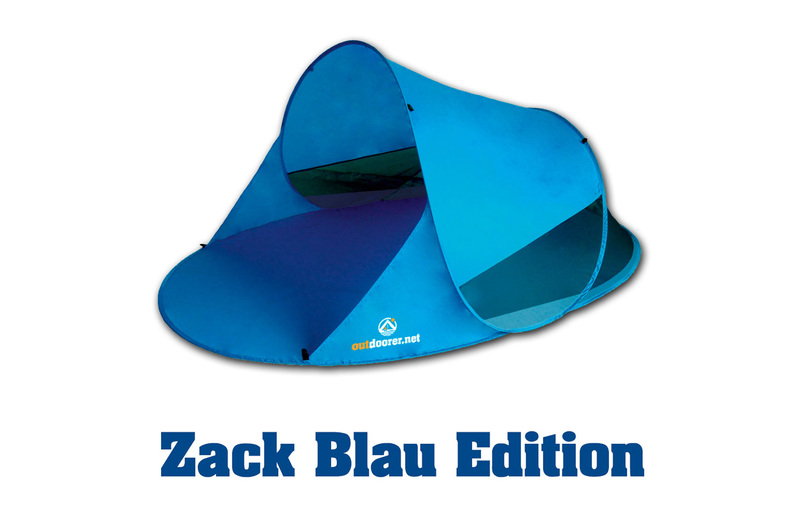 Where can you order the Zack II pop-up beach shelter? The Zack II is available at Amazon in all three colours. Protect your Zack II beach shelter from cracks or small holes in the ground with the rugged beach shelter base protector. This is especially designed for the pop up beach tent and is secured to the ground with three pegs. Click here for further informations. For a quick and easy dismantling watch our video. Share your experience with the Zack II beach shelter by leaving a comment.